A look at the brand's recent ads - including the one released around Father's Day - and communication strategy. The story of an ex-convict being narrated in an Indian consumer electronic company's ad film may not sound like the quintessential assortment for a Father's Day ad. Micromax clearly thinks otherwise. On the occasion of Father's Day, the Gurgaon based company has decided to tell the story of an auto driver, T. Raja in a three-minute-plus video film. The video, which is titled 'Meet Daddy: The Selfless Father to Thousands' has no mention of the brand's products throughout its long runtime. Only towards the end does one see the Micromax tagline - 'Nothing like Anything'. The ad film has been crafted and conceptualised by The Logical Indian and was released on June 16, 2017 by the brand's YouTube channel. Upon close scrutiny, one can see that Micromax's TVCs focus solely on the product and its features (Remember Akshay Kumar's flashy ad?) while the recent Mother's Day digital ad film (What Mom Really Wants) utilised a strong emotional connect to advertise the brand's mobile phones in an indirect way. Micromax even chose to associate itself with an ad campaign by Corning Gorilla Glass that followed the strenuous routine of Mumbai's Dabbawalas. 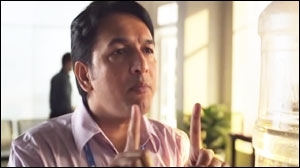 With the new Father's Day ad, which is silent on the brand's products, a clear divide can be seen in the way Micromax is opting to advertise its products on television and digital platforms. In order to better understand the brand's advertising strategy, afaqs! decided to speak to Shubhodip Pal, chief marketing and commercial officer, Micromax. He says, "Both these films come from a basic universal truth and insight that in our busy lives, we often ignore things and moments that matter the most. However the storytelling and narrative are different in both. While in the Mother's Day film we highlighted the insight with the generalised story of a mother and son that many could relate to, in the Father's Day film, we brought the emotion alive with the real story of a man who is literally 'father to thousands' irrespective of their age. It's a moving and inspiring story that we thought had to be taken to millions of people." He adds, "We had been talking to several content creators as we did not want to do obvious, run-of-the-mill stories. With The Logical Indian, we found the perfect partner to stitch T. Raja's unbelievable story which is a perfect example of joy and hope. It's a story that embodies our philosophy of 'Nothing like Anything'. If the product comes naturally as part of the story, then we are happy to include it, it's never a must have." Pal, who recently re-joined Micromax, explains the new challenges in the Micromax universe. He says, "It's good to be back. I was the CMO earlier and was to come back in the same role but that didn't help me and so I took on the additional roles of managing the brand and the online sales together. I have a cost and P&L responsibility which gives me an even better portfolio to manage. Earlier, we had the onslaught of the Nokias, Blackberrys and Samsungs of the world," a challenge that is now redundant as technology has helped homegrown brands like Micromax compete with global rivals on level ground. Pal adds, "Now it's a new turn of chapter; we have Chinese brands coming in so it's a big challenge for me. It's now down to (competing with) Chinese brands. I keep saying this and I'll say this again - we'd love to have Chinese for lunch!" The current lot of prominent Chinese handset brands in India includes Oppo, Vivo, Xiaomi, OnePlus and Gionee, among others. The ad follows the journey of T. Raja, an ex-convict, who founded the New Ark Mission in the year 1997, to rescue and rehabilitate deserted and dying people from the streets of Bangalore. The shelter home is located in Doddagubbi Village, Bangalore and around two hundred residents currently live here. Raja is popularly called 'Daddy' by the inmates. Speaking about the content of the ad and discovering T. Raja, Abhishek Mazumdar, founder and chief executive officer, The Logical Indian, shares with us, "Our content is generated via various means. One of them is where we interact with NGOs and city public officials. We got to know about T. Raja's work while interacting with an IAS officer in Bangalore. We were amazed to know the amount of effort that he has been putting in and the magnitude of change that he has brought. That's when we decided that this story deserves much more than being featured as a news piece. One major impact that we could create was that thousands of people came forward, inquiring about how they can contribute or volunteer with Auto Raja." "... He (T. Raja) was in Ooty for the marriage of his inmates. Whatever is shown in the video, especially the helping moments, is all candid," adds Mazumdar. Is it okay to let content eclipse brand? In the recent past, we witnessed a wave of content-heavy ads that allowed the story to shine while the product was mildly advertised in a blink-and-you-miss-it format. (Remember Marico's no-nonsense hair cream ad, Samsung's #SapneHueBade video or LazyPay's comedian gimmick?) However, it remains uncommon for a durable goods brand to let content completely eclipse the brand itself. We asked the experts to tell us whether this new advertising formula works or not. Pramod Sharma, executive creative director, Rediffusion Y&R feels that something is amiss. He explains, "It (ad film) doesn't work for me. The ad should have a stronger brand connect. A lot of ads having similar content are floating around - someone doing something for society. If one notices, the entire Bajaj Invincible series is about individuals who help others. Even Vodafone's ad had atleast some connect to the brand. On one hand, everyone is telling you to go online but here's a category leader that tells you to go offline with your father. In the case of Micromax, the brand has done something totally out of the blue and I find no brand connect. That's my biggest worry with the new ad." Speaking about the execution, Sharma says, "These ads are meant to be raw and simply shot since they portray reality. But yes, it could have been shot better." However, our other expert believes that the ad strikes the right chords. Ram Subramanian, ad film-maker / peace and equality activist, Handloom Picture Company, tells afaqs!, "This video helps brand Micromax and deposits a positive emotion into the minds of the consumer for the brand name. I don't think this video was meant to 'hard-sell' a product or a feature. What works for the video is Auto-Raja's story, the execution does not have any production value but since the story is the execution, it works." "It's heart-warming to see that we have heroes like Auto Raja who are making a difference in society and brands like Micromax are promoting such individuals," adds Subramanian.